The Audio Garage is a different kind of retailer. Lots of companies talk about putting the client first, but for us, that is a way of life. From our humble beginnings in 2004, working out of a small garage, to our current, state-of-the-art 3,000-square-foot facility, we know our growth has come from putting the needs of our clients first. What this means is that we do things very differently. If you come to see us looking to upgrade the audio system in your vehicle, you will find us spending little time focusing on brands and specific products. Rather, we will do what we call an audio consultation. We will spend significant time on looking over the vehicle with you, listening to the current audio system and exploring how you use the vehicle. Is it a daily-driver, a second vehicle or a prized possession that only comes out on special occasions? Our team will listen as you explain your goals for the upgrades and will ask leading questions during the conversation. We do all of this to get a better understanding of the clients needs so we can offer solutions designed to best fit your unique needs. Does this sound different to you? Once we gather all of our needed information, we take you into our state-of-the-art showroom to listen to products that we feel will be a good fit for you. We are still baffled over why people will spend hard-earned money on audio products without ever hearing them. At the end of the demo, we will work up a specific solution for you, designed to meet your needs. Once you approve the proposal and the vehicle comes into our installation bay, it will be worked on by some of the finest technicians in the country. We spare no expense to ensure that your vehicle is well-cared-for, so you can expect to receive it back from us in the same condition as we received it. Our team members have the luxury of working in a well-equipped install bay with a full suite of diagnostic and testing equipment at their disposal. This allows our technicians to be more efficient in their time while ultimately doing their jobs better. When it comes time for them to perform the installation, a well-equipped wood shop, metalworking shop and fiberglass shop are at their disposal. Once the installation is complete, the vehicle goes through a detailed check-out procedure to ensure everything is in proper working order. When you come to pick up your vehicle, one of our team members will go out to it with you and explain the operation of your new equipment. In the future, should the need ever arise for more training on operation, we have your back. Period. 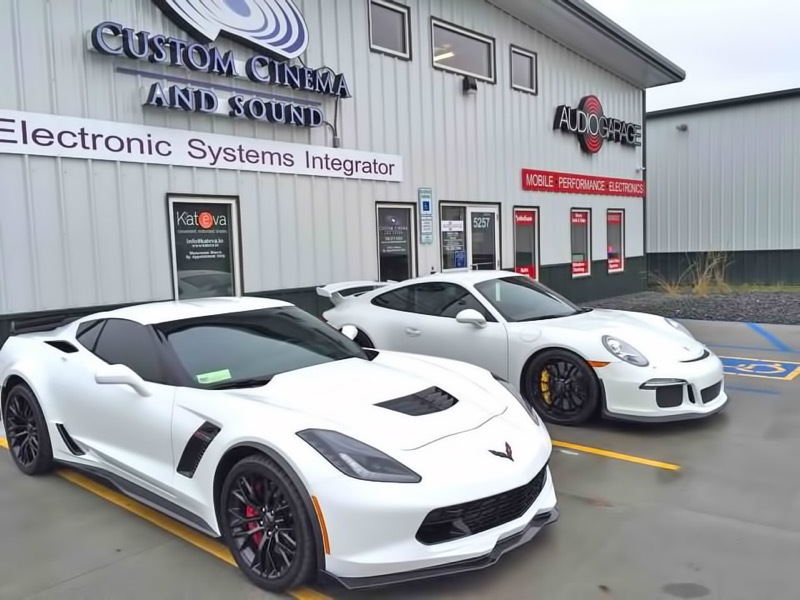 The Audio Garage uses this same process whether you are looking for a complete audio upgrade or having paint protection film installed on your vehicle. Our unwavering goal is to provide you with the right solution the first time so you can focus on enjoying your upgrades for years to come.